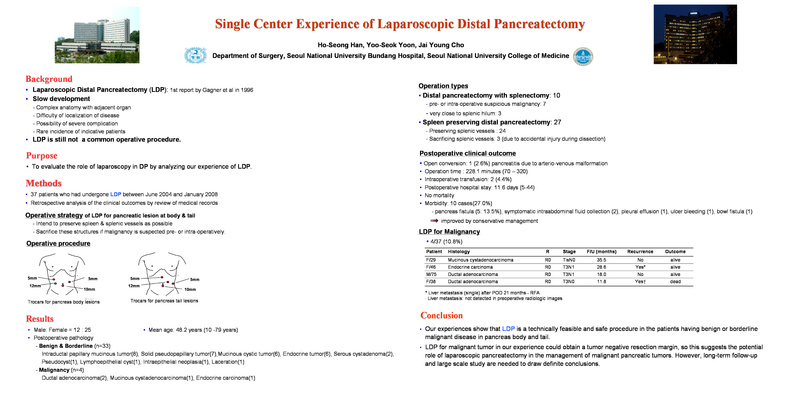 Bakground: Although an increasing number of reports on laparoscopic distal pancreatectomy (LDP) have recently been documented, it has not achieved worldwide acceptance yet. The aim of this study is to analyze our experiences of LDP and evaluate its usefulness. Methods: Thirty-two patients underwent LDP from June 2004 to July 2007 in Seoul national University Bundang Hospital. The preservation of splenic vessels and spleen was tried unless the tumor was very close to splenic vessels or malignancy was suspected in preoperative radiologic studies. We retrospectively analyzed of the clinical outcome of these 32 patients. Results: There were 11 men and 21 women, with a mean age of 47.8 years. Indications were 10 cystic neoplasm, 7 intraductal papillary mucinous tumor, 5 solid pseudopapillary tumor, 2 pseudocyst, 5 endocrine tumor, 1 traumatic laceration, and 2 pancreas tail cancer. No conversion or transfusion occurred. Spleen was sacrificed in 4 patients with suspected malignancy. Spleen and splenic vessels were successfully preserved in 23 out of 28 patients (82.1%). The mean operation time was 231 minutes, mean size of the lesion was 4.8cm and mean hospital stay was 11.1 days. Postopereative complications occurred in 10 cases (31.3%), including 5 subclinical fluid collection, 1 symptomatic pleural effusion, 1 ileus (n=1), 2 intra-abdominal abscess, and 1 pancreatic fistula, which were improved by conservative management. Conclusion: Our experiences show that LDP with preservation of spleen & splenic vessels is a technically feasible and safe procedure in the patients having benign or borderline malignant disease.